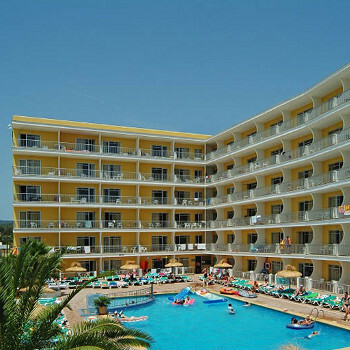 Stayed at the Miami Ibiza Hotel Intertur, the place was quite nice, clean and tidy, well kept, ideal for a beach holiday. There were plenty of sunbeds but it was early in the season the weather was warm enough. There's self-catering apartments across from the hotel which we had a look at they were kept nice and tidy. It's nice and quiet would go back that time of year overall I was impressed, though my only complaint was that the sunbeds on beach a bit expensive. Hotel very clean in all areas. Food to suit everyone. Restaurant has highchairs but no trays on them and they don’t fit under table. Reception staff very slow. We wanted to keep on 1 of our rooms as we had 10 month old baby with us. Booked it 48 hours before departure then had to check 10am on departure day to see if we could keep it on. We could keep a room on but not our room, what is the point of paying 34 Euros and moving to a different room. Check out time 12 o clock so we used courtesy room which is very clean. You have to queue up for a poolside sunbed or a one with a shade, it is a nightmare. People start queuing around 7.30am for doors opening at 8.30am but it is a free for all. An accident is waiting to happen. Visited the Miami Whitsun week and booked through Thomas Cook. Last year we went to Kos 5*, so was a little bit wary going 3*, but I've got to say the Hotel was very clean - rooms, corridors, reception and surrounding areas were kept immaculate. We stayed half board and found plenty for breakfast from pancakes to cooked breakfast with english sausages. Our 11 year old daughter who is extremely fussy ate the best here in all the years of going abroad. Evening meal there was plenty of variety and delicious desserts. The pool was nice but I felt it could be bigger considering the size of the hotel. The downside to this hotel is if you want a sunbed by the pool you had to race 1st thing in the morning to get one and the pool area would be jam packed although there are plenty of sunbeds on the terrace. Don't know if we would stay there in August at it's peak. Reception staff were a little bit abrupt but the Thomas cook rep's seemed to be around the majority of the time. Location is lovely right on the beach and a lovely 5 minute walk across the beach to Es Cana's shops and restaurants. Couldn't say there's anything really bad about this hotel - its 3* and very nice. If you want 5* then book 5*. Will we return? Yes, we had a lovely week, for the price! You must visit the Hippy Market on a Wedensday. Hotel was very clean. Food good especially the fish, there was something for everyone. The location was lovely, right on the beach. Staff were good. The entertainment was not good but we didn’t go for the entertainment. We would go to this hotel again. just choose your flight times wisely as the rooms are never avaliable till after 2pm so you could be waiting a long time. pool too small for number of guests. 1 tiny small kids pool, 1 med kids pool and a larger pool no good for kids as very deep 1.9m be careful! queued for sun beds at 7.15am even though the doors dont open till 8.30, but the queus are horrific people pushing but if you want a bed you need to do this. not enough beds for number of guests, sardines in a tin spring to mind lol. room on the small side, just room for the three of us,balcony very small just fits 2 chairs upgraded to a premium room which was better lovely sea view,cleaned every day so lovely and spotless. beach right on the door step, went here everyday, 4 euro for a bed the same for a parasol, much better as its not packed and we could still get a bed at 11.30am! all inclusive good, not much snacks inbetween except left over lunch a few biscuits at 5pm, drinks good proper pepsi/7up etc, queues for the bar was a bit of a wait but it was the busiest period. We have just returned from a two week stay at the Miami, Overall we have had a good holiday BUT there are a few things this complex would do well to improve. We arrived at 10.30am after an early flight from gatwick, Check in was painless enough as we were the only people on the coach staying here. We had our photo taken and this was printed and became "THE CARD",more on this later. We were pleased to be informed our room was ready so we headed of to unpack. We had pre booked an upgraded premium room and first impressions were that it was very small, We were on the top /5th floor and had a great view of the beach and bay. In the room was a flat screen tv with sky news and several other channels, also we had a playstation 2 but you have to put a deposit on the control if you want to play games or watch a dvd. We had taken our own and some dvds & games for our lad to use whilst we got changed etc. There is also a very small mini bar fridge but you needed to pay a 50 Euro deposit for it to be opened. This raised the first real issue, We had paid for all inclusive but were expected to pay high prices for a drink of water from the fridge or a beer on the balcony? I think not so we left it but it was opened anyway on day 2 ?? The air con in the room was useless despite us removing the plastic key fob from the key and leaving it in the wall slot and thus having it running 24/7. We complained and they sent a guy who fiddled with it but it was just rubbish. OK onto the pool area. There is one pool divided into 3 sections, the main pool has no shallow areas so you cant stand up in any area. This was fine for us as we all swim but be careful with kids who aren't water confident. The other two sections are a small paddling pool and a slightly deeper children's section. SUNBEDS!!!!!! Issue number 2! If you want a sunbed here you will have to be prepared to get up and Que at the pool doors with half the hotel, The doors open at 8:30 and people storm the doors them run "yes run" to secure there favoured spot! Having a pregnant wife who could only sit in the shade meant we too had to get involved in the sunbed dash, we sat in an area of lovely shade under the tress everyday as there were very few umbrellas out in the sunny section. The beds are all crammed in very tight and are all non adjustable so hard to sit up if you want to read etc. On the plus side there are some nice lay back deck chairs but again you will need to be sharp out of the stalls to get one!!! On to food and drink and it does get a bit better, Breakfast was very good for an AI hotel and the other meals were not to bad but very repetitive. You may well get knocked back at passport control on your way home as you now look like a chicken nugget with pasta legs. Help yourself to beer and wine in the restaurant and enjoy drinking out of a glass as its plastic cups everywhere else. The pool bar caters for daytime and evening , the beer is Cruzcampo and probably the best I have had in a good number of AI places. The staff however are very stail! Misserable people who obviously dont enjoy there job. I am lucky to have travled to many places around the world and am still in touch with some of the guys behind the bars I have met but not here! you will have to stand in a long line and wait to be nodded at before placing your order with the expresionles seemingly partialy deaf operative here. There is a smaller bar in a corner of the terrace and a bar inside so its a case of getting in the smallest que. "THE CARD" you will use this word alot during your stay, The card is your key to food and drinks but there is only one card per room so if you get out of the pool and want a drink for example you will have to go and find the member of your party who has the card first. A wristband is so much better and the card is indeed a pain in the backside esp if one of your party goess to the shops or room with it you cant get anything. The location is good and is set on the beach at the end of the bay, There is a small rocky area rite by the steps where you can catch crabs and little fish in a net. Also there in a little pontoon to fish from and we had some great afternoons catching a varied selection of fish caught on bread, sweetcorn and sausage all pinched from the buffet! A short walk along the beach and you are in the small resort, we ate out a a few places and the food was generaly good. The Menu prices were alot lower than I expected mainly due to stiff competition as many tourists are based in AI hotels. Entertainment was a bit hit and miss , Some of the visiting acts were good but the hotel entertainers were not exactly x factor candidates. They did do an exelent job with the kids tho and the cravy kids disco was popular, most of the songs were in German despite it being a mainly British audiance. Look at for thr tune about the "special little engine"!! Onto major issue 3! There are knowhere near enough tables and chairs outside to host the paying guests. To get a seat we had to eat at 7 when the restraunt opened and then go straight to the pool area to get a table. It really was bad to see people who had dressed up nicely for the evening having to sit on sundeds covered in dirt and suncream. Good friendly staff at reception. Just choose your flight times wisely as the rooms are never available till after 2pm so you could be waiting a long time. Food excellent and hot! Breakfast the best with English sausage yippee lots to choose from fantastic salads lunch a bit iffy not much choice but generally brill, themed evening Chinese and Italian could be a bit repetitive for 2 weeks. Make sure you get to the restaurant early as you can as the queues were very big, but food always replenished. Pool too small for number of guests. 1 tiny small kid’s pool, 1 med kid’s pool and a larger pool no good for kids as very deep 1.9m is careful! Queued for sun beds at 7.15am even though the doors don’t open till 8.30, but the queues are horrific people pushing but if you want a bed you need to do this. Not enough beds for number of guests, sardines in a tin spring to mind. Room on the small side, just room for the three of us, balcony very small just fits 2 chairs upgraded to a premium room which was better lovely sea view, cleaned every day so lovely and spotless. Beach right on the door step, went here every day, 4 euro for a bed the same for a parasol, much better as its not packed and we could still get a bed at 11.30am! All inclusive good, not much snacks in-between except left over lunch a few biscuits at 5pm, drinks good proper Pepsi/7up etc., queues for the bar was a bit of a wait but it was the busiest period. Entertainment very loud but always something for kids to do, reptile show, dancing etc. The location is the best bit. Its not really All Inclusive but more full board with free drinks, those who have been to a good all inclusive will understand what i mean here. The hotel is just not big enough to cope with the number of quests, Que's for sunbeds ,drinks, restaurant, and seating for the entertainment this is just not acceptable. It will probably be better early or late season?? The aircon in the rooms is very poor and the rooms very small even the premium rooms. Nice holiday but far to many downsides to recommend this place to anyone unless you get it really cheap last minute. Not a bad place but we have had much better for the same money, the location is the best bit. It’s not really All Inclusive but more full board with free drinks, those who have been to a good all inclusive will understand what I mean here. The hotel is just not big enough to cope with the number of quests, Queue’s for sunbeds ,drinks, restaurant, and seating for the entertainment this is just not acceptable. It will probably be better early or late season. The air con in the rooms is very poor and the rooms very small even the premium rooms. Nice holiday but far too many downsides to recommend this place to anyone unless you get it really cheap last minute.